A medium sized black aluminium flight case with a professional finish and pre-cut foam. 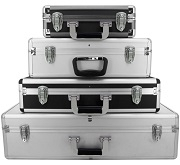 Silver Aluminium Flight Case with pre-cubed foam and padlock loops. Small, smart and stylish! Reinforced corners, handle on top of this cube styled case for ease of access, padlock catch for keeping your valuables safe.